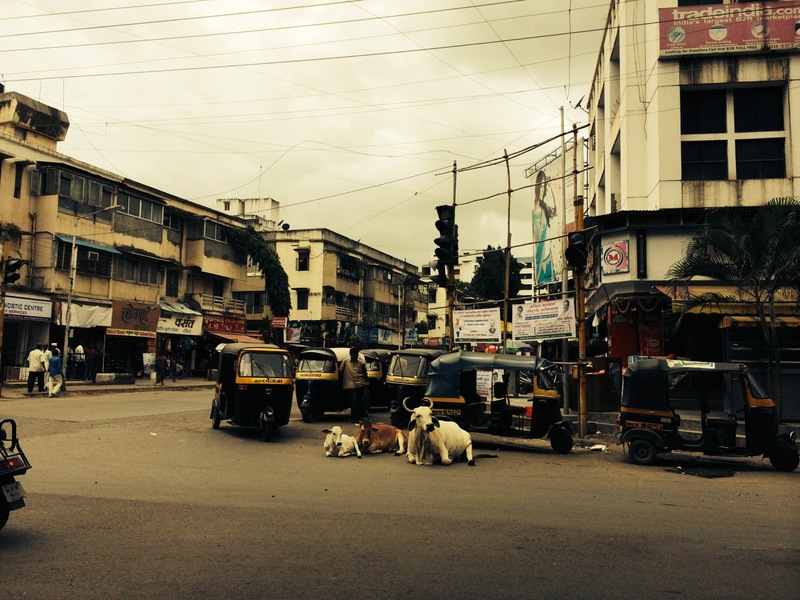 One day, walking home from shopping, I saw an ox in the middle of a busy road. 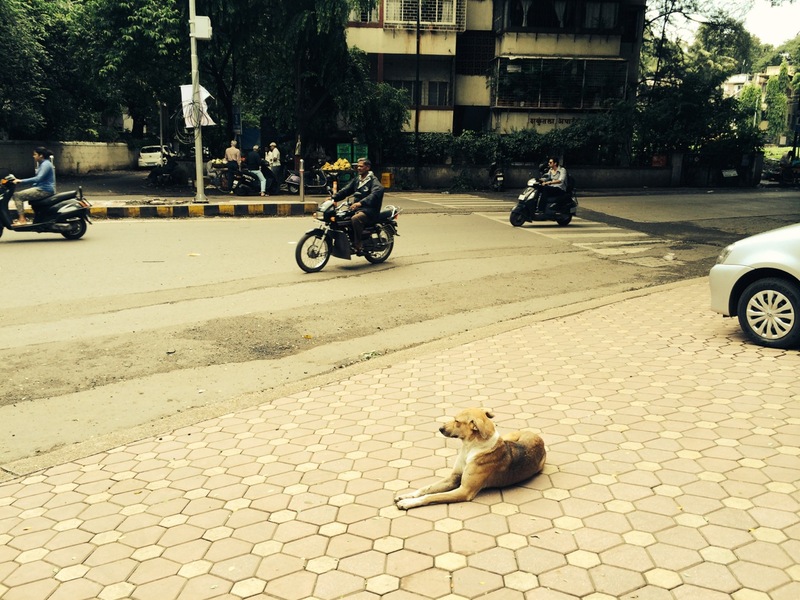 He stood still and calm, engulfed by endless cars, auto-rickshaws, and motorbikes. He was unperturbed by the loud honking, directed less at him than at other drivers. I was amazed that he wasn’t hit. A couple of shopkeepers were watching with amusement. I joined them, waiting for an owner to appear. A man, braving the traffic, handed the ox something to eat, but he was only crossing the street. The cow chewed the food. 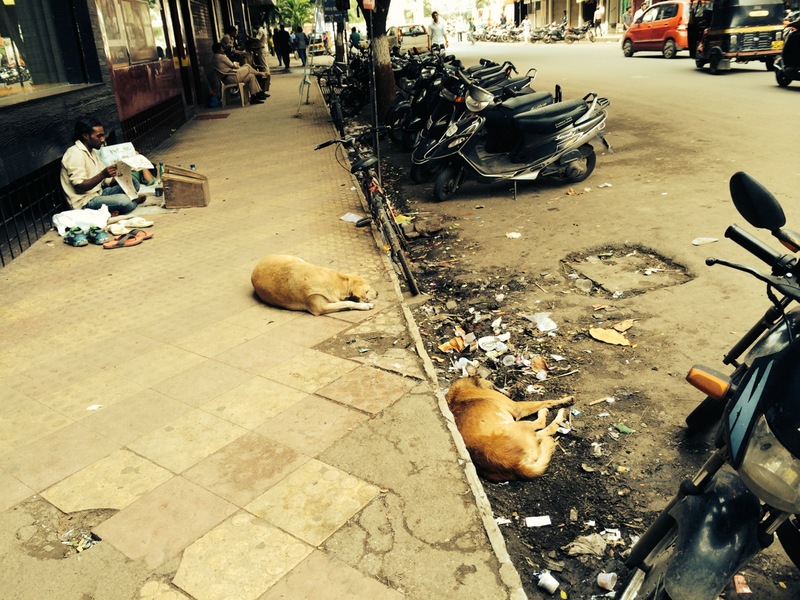 In Pune I see a lot of stray dogs. They hang out in empty lots, busy streets, near shops and produce vendors, even in garbage-ridden gutters. They’re everywhere. (Dog poop is also everywhere. Watch your step!) They appear lean but not starving. They are calm and never bark or act agitated. They resemble short-haired mutts you might adopt from the pound. This one hangs out directly in front of the Toyota dealer. One night in my apartment, I heard a cat fight; the low guttural growling went on forever. I rarely see cats around in daylight. One rainy day, however, I saw a skinny cat creeping around outside Pune Central mall. I was walking toward the entrance and the cat suddenly noticed me, cowered, and skittered away. It broke my heart. I love animals and can hardly stand to see them so fearful and miserable. I am really enjoying your India series. Thank you! A very California story indeed! 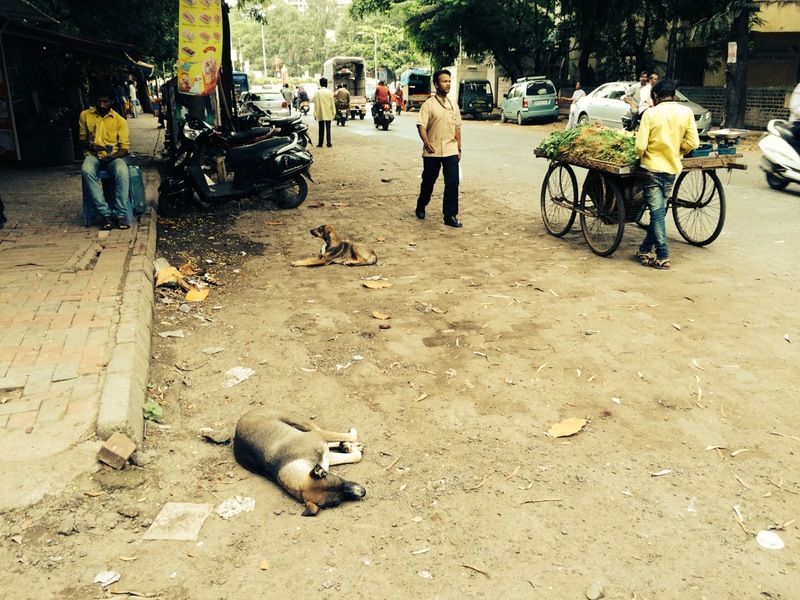 Here, stray dogs abound, and they are remarkably adept at crossing the street. They look left and right and proceed when there’s an opening. Survival skills are essential here.